SolarCity announced today that it has built the most efficient rooftop solar module with 22% efficiency according to a third party tester: Renewable Energy Test Center. Until now, SunPower’s X-Series panel was considered the most efficient rooftop panel with 21.5% efficiency. SolarCity CEO Lyndon Rive says that the new modules will produce between 350 to 360-watt compared to the company’s current 260-watt panels. Production will start as soon as this month at SolarCity’s 100 MW pilot facility in Fremont, California, but they plan on transfering the production to the 1 GW Gigafactory in Buffalo. Recent pictures show the Buffalo plant to be almost complete from the outside. The SolarCity’s Gigafactory is expected to produce between 9,000 – 10,000 solar panels each day at full capacity. 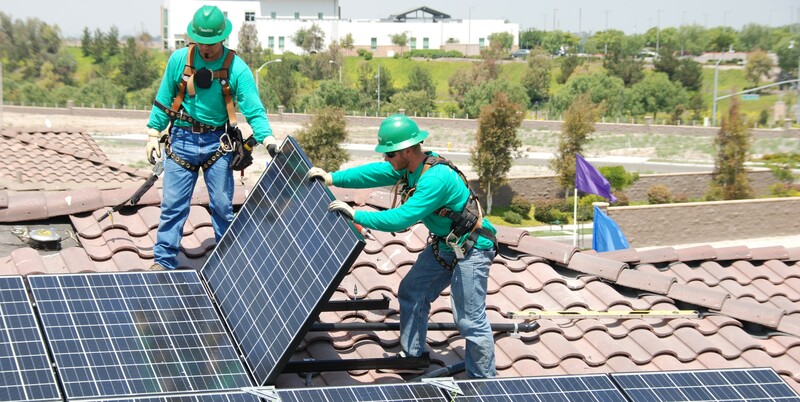 They will first install the panels on rooftops and carports for homes, businesses and other organizations, which represent SolarCity’s core installation business, but they also plan to use the new high efficiency panels for utility-scale projects which is relatively new for the company. Most of the company’s power generation is on residential rooftops. Interestingly, the first panels, which is expected to significantly increase America’s solar module manufacturing output, will be produced at the former headquarters of the defunct solar panel-maker Solyndra. Solyndra received loans from the Department of Energy and after the company went under, the Obama administration was criticized by then presidential candidate Mitt Romney for picking “losers”. Romney inculded Tesla Motors, which was in a difficult financial situation at the time, in his list of “losers” for also having received a loan from the DOE, although under a different program than Solyndra. Elon Musk, CEO of Tesla Motors and Chairman of SolarCity, took the statement personally and even tried to contact the Romney clan. Now a few years later, Tesla is now using Solyndra’s former manufacturing facility in Fremont, California, where the automaker just launched its Model X, and SolarCity is using the former solar panel maker’s headquarters to produce the most efficient rooftop solar modules ever made. CEO Lyndon Rive and Chairman Elon Musk will officially announce the new panel with more details later today at the Inside Energy conference.